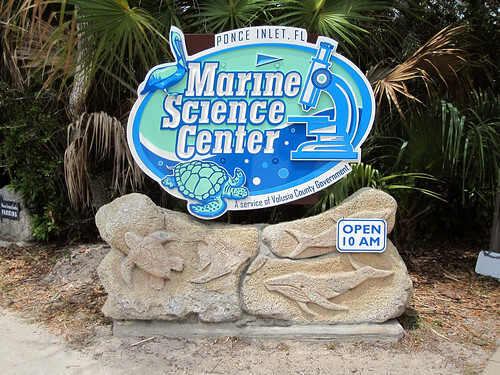 Last month Arthur and I visited the Marine Science Center in Ponce Inlet. 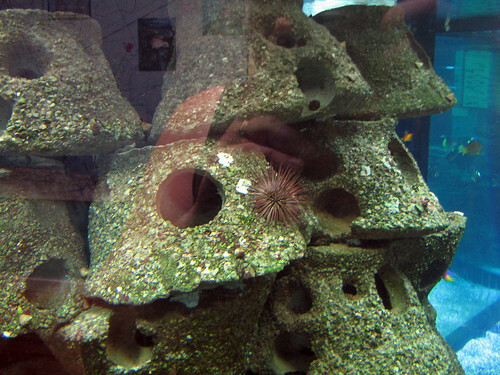 The small center has marine life exhibits and displays. 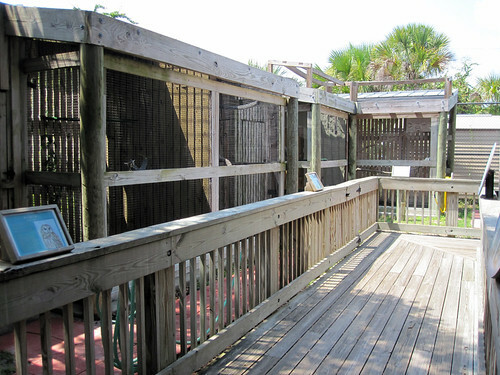 They also have facilities for both turtle and bird rehabilitation. Welcome to the Marine Science Center! 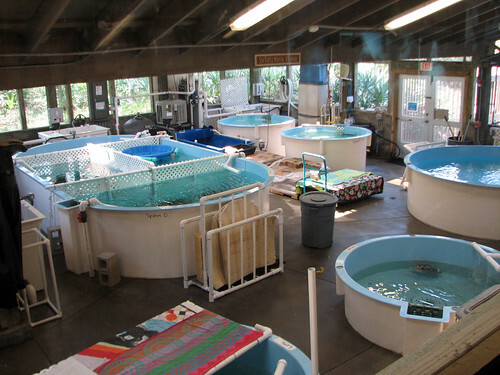 The main building houses several (mainly aquatic) exhibits with turtles, lobsters, sharks, fish and rays. As you’d expect at such a facility, the aquariums and animal enclosures are accompanied by informative (and impressively comprehensive) signage. 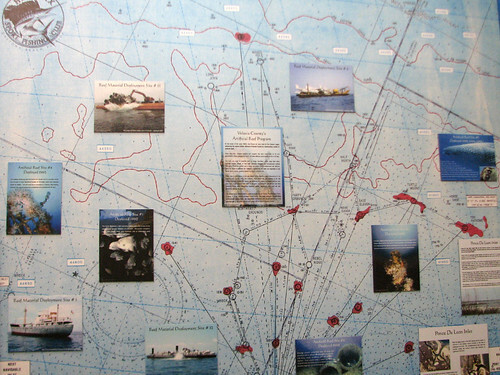 Several displays are devoted to Volusia County’s Artificial Reef Program. Over 40 artificial reefs play host to aquatic life in Volusia County offshore waters. The reefs consist of the remains of ships, airplanes, and barges, large concrete rubble and other discarded construction materials, and specially constructed reef balls. If you don’t know about artificial reefs, it may sound like the county is just dumping junk in the ocean. First, the reef material is treated to remove any harmful elements. Within days of the artificial reef material settling on the ocean floor, living organisms begin to inhabit the reef. As the community expands around the growing source of food and shelter, larger, predatory fish begin to visit the reef. In time there is a thriving reef where there was once not much more than water and sand. My favorite indoor exhibit was the stingray touch pool, occupied by cownose stingrays, Atlantic stingrays, and a few other species of fish plus some crabs and other organisms. 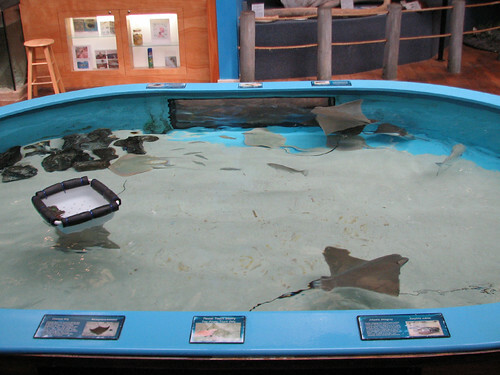 The rays circle the pool and visitors can touch them. One particular cownose stingray was extremely endearing. It would slow down as it approached an outstretched hand, and rise up to the hand to be petted. It was a lot like a head-bump from a cat. You can see this in the final seconds of the video below. Super-cute scritch-lovin’ cownose stingray in last seconds of clip! As we were enjoying the marine displays, it was announced there would be a short bird of prey program in the classroom, which was a nice surprise. 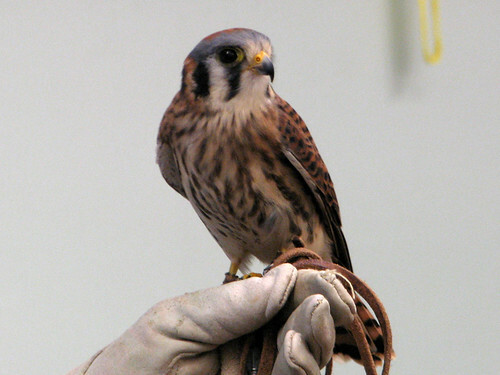 A volunteer gave a short informal program along with Priscilla, a four-year-old American Kestrel. Priscilla is an imprint, along with four other female nest-mates. They were raised illegally by a member of the public before being brought in to rehabilitation. She and her sisters are all non-releasable ed birds at different licensed facilities. Priscilla is not the only education bird at the center. 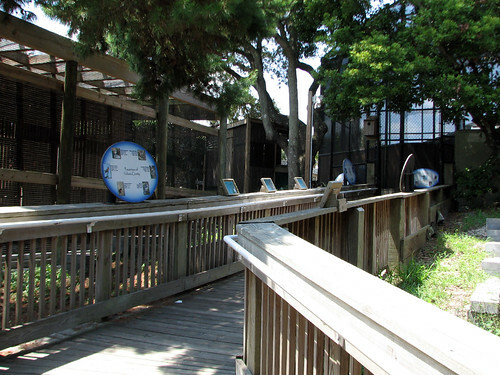 Outside there are several enclosures holding permanent resident marine birds like Brown Pelicans, gulls, and a Black Stork. There are also mews with birds of prey. The resident raptors include a pair of Bald Eagles, Red-shouldered Hawks, a Barred Owl, a Great Horned Owl, a Swallow-tailed Kite, and others. The Mary Keller Seabird Rehabilitation Sanctuary on site has treated over 4500 birds since it opened in 2004. 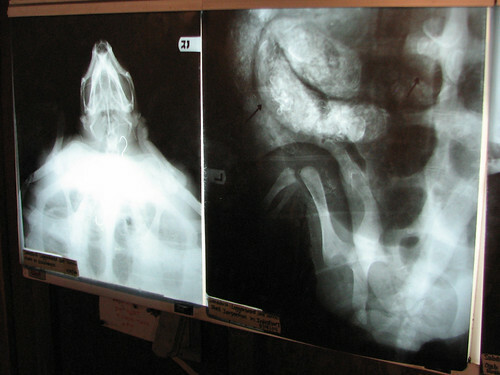 Not only seabirds are taken in; over 140 bird species have been patients. While some education material and rehab information is visible to public visitors, rehab patients and other facilities are not open to the public. The center also takes care of injured sea, freshwater and terrestrial turtles and part of their turtle hospital facilities, as well as information about the dangers sea turtles face, can be viewed by visitors. 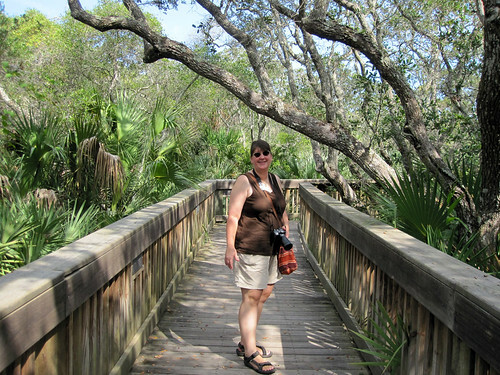 Finally, there is a short nature trail and boardwalk that leads to an observation tower. We didn’t see too much on our hot mid-afternoon walk except for a lot of big, beautiful spiders. 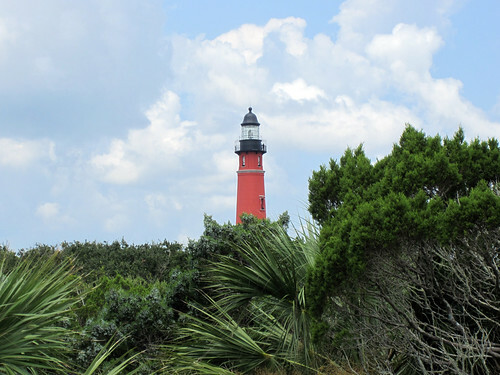 The historic Ponce de Leon Inlet Lighthouse is visible from the path. Volusia County’s Marine Science Center is a great destination for nature lovers who want to learn more about area wildlife, especially marine ecology. I am sure we will be back! This entry was posted in Florida, Museum, Rehabilitation, Volusia Birding. Bookmark the permalink.